It’s not news when a European instrumentalist and composer is seduced by the charms of music from other realms and cultures. That’s been happening for centuries. But when the musician takes the plunge, immersing him or herself in ancient traditions and rites becomes not simply beguiled, but renewed in their cleansing fire that is breaking news. Steinar Aadnekvam, a Norwegian guitarist with a unique singing style, has not only been reborn, but lives and breathes in the air of a Utopian world of music, where he always finds a direct, unimpeded path to secrets of musical truth and eloquence. And when he ‘emerges’ on the ‘other side’ you will be hard-pressed to find a virtuoso who is more musicianly. The hallucinatory magic of this near-narcotic music springs from a master of ever-changing colour, light and shade in such a manner as to combust in the passion of the moment. As one of the leading lights in the playing of a nylon-string guitar Steinar Aadnekvam’s exploits often recall the speed and power of Al Di Meola from his halcyon days with Chick Corea. Aadnekvam’s music with this Freedom’s Trio is born not of the exigencies of form and convention but is played in defiance of them. As a result the music is rhythmically-free and the ebb and flow of tension brought out to perfection. On this smartly-produced album he also shares compositional credits with the other members of the trio – a Brasilian bassist, the quite sensational Rubem Farias, a virtuoso with dizzying skills, and Deodato Siquir, a Mozambican, percussionist with a painterly manner, who was schooled in the bands of Joe Zawinul, Linley Marthe and Etienne Mbappé. Together, this power trio literally go the distance, sculpting the air with music that is unique and unforgettable. The ten songs on this album present the miraculous visions of three individuals with unique, disparate personalities in a cohesive whole. Song-names such as ‘Modern Information’ and ‘Very Troubled Dogs’ are slightly whimsical, but are musically endlessly poetic. 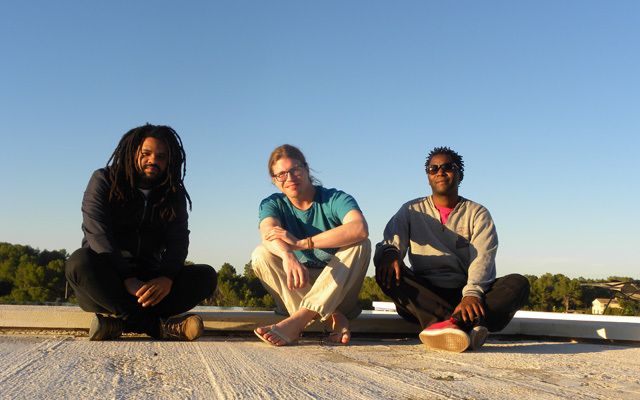 ‘Phlyde’, ‘Vem Nao Vem’ and ‘; Mikombelo (Prayer)’ are vivid and compelling. And it seems that absolutely nothing could go wrong elsewhere on the album as songs unfold with tireless innovation and originality. A superlative record. Track List: A State of My Own; Phlyde; Vhuya ka mina (29th of April); Modern Information; Sweet Are The Lies You’ve Been Telling Me Lately; Terra Mae; Very Troubled Dogs; Vem Nao Vem; Lamento; Mikombelo (Prayer). 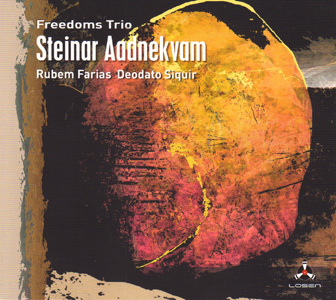 Personnel: Steinar Aadnekvam: guitar; Rubem Farias: bass, vocal; Deodato Siquir: drums, percussion, vocal.